You can eventually lose 60 pounds working out on a treadmill, but it will take several months. The length of time it takes depends on your current weight as well as the frequency, duration and speed of your workouts. Each pound is worth 3,500 calories, which means you need to burn off that amount to lose 1 pound. A faster alternative is to reduce calories with healthy changes in your diet along with your treadmill workout. Walking on a treadmill is the slowest way to lose weight since you’re burning the least amount of calories. 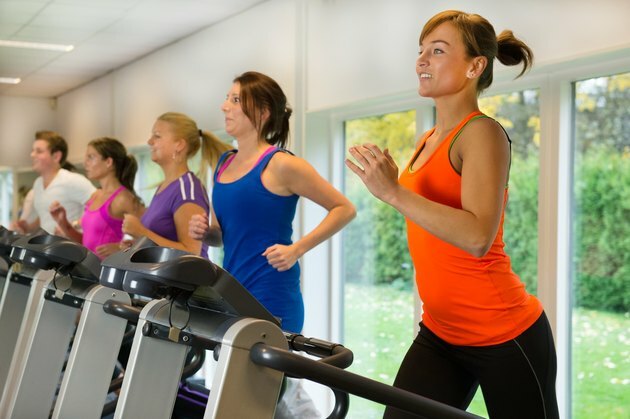 Walking on a treadmill at a rate of 3.5 mph burns 277 calories per hour for a person who weighs 160 pounds. An hour a day every day translates to a weekly burn of 1,939 calories and a weekly weight loss of 0.55 pounds. Walking at this rate, with all other factors constant, yields a 60 pound weight loss in about 110 weeks, or more than two years for the 160-pound person. Jogging at a rate of 5 mph on the treadmill burns 584 calories per hour if you weigh 160 pounds. This translates to a weekly burn of 4,088 calories and weekly weight loss of 1.17 pounds. Losing 60 pounds while jogging would take the 160-pound person about 52 weeks, or an entire year. If jogging at 5 mph is too fast, you can still decrease the time it takes to lose the weight by increasing your speed above 3.5 mph during your workout. Running at a rate of 8 mph burns 986 calories per hour for the 160-pound person and is the fastest way to lose the weight on a treadmill. The 986 calories per hour translates to a weekly calorie burn of 6,902 and a weekly weight loss of about 2 pounds. It would take 30 weeks to lose 60 pounds at this running rate, or less than one-third the time walking on the treadmill would take. As you lose weight and continue your treadmill workout, you will start to burn fewer calories that you did at your heavier weight. This can make the weight loss take even longer than the initial calculations, although increasing the length or speed of your workout can make up for the calorie difference. Adjusting your diet to decrease calories can speed up your weight loss even further. A healthy weight loss goal is 1 to 2 pounds per week. Cutting out 500 calories per day for a week can result in a weight loss of 1 pound in addition to whatever your treadmill workout burns.